Choosing the right iPhone Running app isn’t exactly a walk in the park. Most of them offer a bundle of cool features, some more than others. It all comes down to what you want to achieve through your daily or weekly running routines. If you plan on losing weight and staying fit, you can do that. If you want to immerse yourself in an imaginary zombie apocalypse – you can do that as well. It seems that really there is no limit to the ingenuity of app designers. The only limit in your fitness, therefore, is yourself. Seeing that we can’t do much about that, we decided to make a rundown of the best iPhone running apps that are available for free on the App Store. If you want premium versions for these apps, however, you will have to pay up to $10 per month (just one example). Still, for this fee, you will get a service so great that you will probably end up running even in your sleep. A highlight of one of the apps we’re going to show you below. Jokes and zombie running aside, iPhone running apps are a delight of modern technology. Let’s recap what you need for a good exercise: good running shoes, a good track suit, strong will, a bottle of water, maybe some armbands, and a healthy meal waiting for you at home. Add to these your trusted iPhone and the best iPhone running app you choose from the ones presented here. Earphones will make your experience a bit more entertaining, and an iPhone running pocket will make sure you don’t look silly. 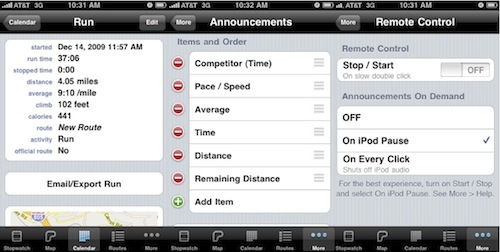 Verdict: best running app for iPhone owners that run professionally. 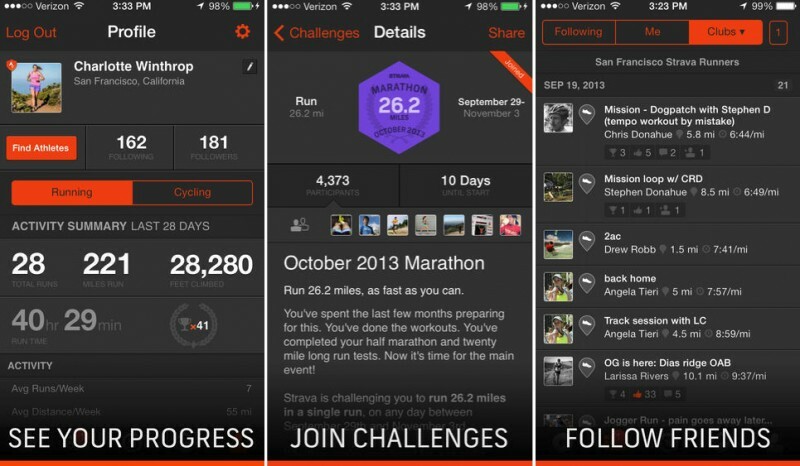 All the positive reviews in the world cannot do justice to the awesomeness that is Strava. Built for professional athletes and amateur trainers as well, Strava offers all sorts of details about your favorite run. It shows you simple things such as running speed, your travel distance, heart rate as well as more advanced things such as weather conditions for every run, a personal log, and Apple Watch integration. Verdict: best running app for iPhone users that like simplicity. Nike scored a major flop with its widely criticized running band which got so many things wrong, it would be a nightmare to count. However, contrary to popular belief, Nike+ Running is an amazing app. It doesn’t like fooling around: it shows only your mileage, your time, your speed, and the calories you burnt. If you want more details, then you will have to stop running. A nice feature is the ability to compete with friends who also have the app. Verdict: Best iPhone running app by popularity. Map My Run could easily win the title for the most popular of the running apps for iPhone. It’s simple. It’s full of all the details you want. It even gives you scheduled updates on your heart rate, speed, running distance, so you can just keep on going without thinking about all these things. The subscription can enhance your experience if you want, as you can unlock access to personal training plans, live tracking, and coaching. Verdict: Best iPhone running app that’s also entertaining. I know this is the first app that is best if you buy, but as many reviews say: you will never regret it. The app has hired a professional writer who comes up with zombie apocalypse narratives. These narratives will play in your head while you are running, so as to make you think that you’re in fact hurrying to save your life. Interesting, creepy, and so much fun! Your daily jogging will never be the same. 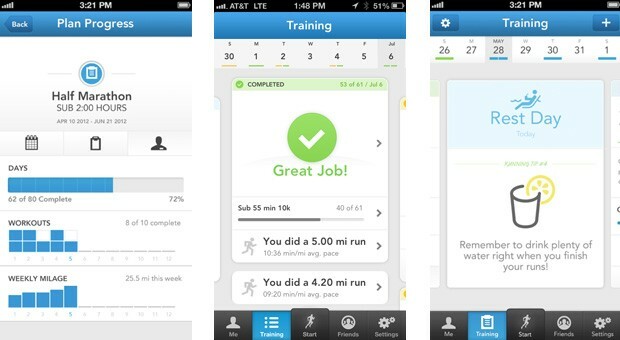 Verdict: Best running app for iPhone users that push it to the limit. Some of you here may be distraught to hear that that this is the first app that’s not available for Android users. However, it surely makes up for this with its awesome features. The free version gives you much more functionality than the free versions of other apps. That’s why we would call this app by far the best iPhone running app if you don’t want to pay for things that you need. Verdict: Most expensive running app for iPhone. But worth it. By far the most expensive paid version of an iPhone running app in the AppStore, the money you would give the developers is well deserved. First off – it was among the first apps specifically designed for jogging, and it’s the only one that has remained relevant for so long. Then, it can give you all the usual stats while running, including the not-so-popular elevation. If you choose to pay, then you even get the number of steps you make, your cadence and it can even track your calories through trans-app synchronization. Pretty cool! So which one do you think is the best iPhone running app? Have you decided yet? Well, we hope you have and that this guide has helped you make up your mind. As for us, well, we’re feeling partial to the zombie apocalypse one. Not that we would want zombies to roam the earth, that is.